It’s no secret that I love eating at Taco Bell. For better or worse, I usually drive about half an hour to a Taco Bell location to get my fix. That particular TB is awesome and has never disappointed me. For the longest time though, I’ve known that location is not the closest one to me yet I won’t go to the closer one. Why? One word: Surrey. If you’re not familiar with the Vancouver suburb of Surrey, let me educate you. For decades now, Surrey has been labelled as one of the least classy parts of the greater Vancouver area. There is a certain perception that the people who live in Surrey, for the most part, are bereft of the behaviours one might learn in a proper finishing school. I hate to stereotype but there is considerable evidence that this just isn’t some joke. There is a Facebook page, entitled “Only In Surrey“, that documents the type of people who live in the suburb. All of this would be somewhat innocuous if that was all there is to Surrey but crime is a huge issue as well. If you look at this Twitter account, which monitors emergency communications for fire, ambulances, and police, a large majority of the crime-related Tweets reference Surrey. It’s clear that people don’t feel safe being in Surrey. From high-profile and senseless killings to a ton of petty crimes, overall Surrey just doesn’t seem like a great place to be. So having said all that, guess where the closest Taco Bell is to me. You guessed it. Surrey. Earlier this week, throwing caution to the wind, I decided to go have lunch at the geographically closest Taco Bell to me, located at the Central City mall. I had a few things that mitigated the risk. First, the mall is located right next to a Skytrain station. That meant it would be easy to get to, would not require driving, and there would be lots of people around. Second, I’d be going in the daytime when there are only daywalkers around. With a sense of adventure in my heart and a desire for cheesy gordita crunches, I headed off. From the time I left my place to when I got off the train for the mall was about 15 minutes, less than half the time for my usual TB journey. There were definitely some sketch people on the train with me but there were also a lot of university students too. The mall contains a satellite campus for SFU. I’d never been to Central City before and it’s actually a nicely designed mall. It wasn’t difficult to find the Taco Bell / KFC combo store in the food court. The people in the food court seemed normal which was good to see. No one accosted me while I ate. As for my actual meal, I got a gordita crunch meal with fries supreme. My gordita was fine but the fries supreme tasted a bit off. Just from my one experience there, the TB location at Coquitlam Centre is definitely better. After eating, I explored the mall for while but I was very cognizant of when the sun was setting. I didn’t want to be in Surrey after dark as I didn’t want to run the risk of encountering problems. I got home fine. Going forward, I will go back to that location again, just because it was so easy and convenient to get to. Central City also has a Bed, Bath, and Beyond which I usually don’t get to go to. I feel like I’ve expanded my horizons (as well as my waistline). If you watched the NHL All-Star game on the weekend you quickly realized it was boring as hell. The skills competition wasn’t that great either. For me, the best thing about the All-Star weekend was the inclusions of the NHL mascots in the festivities. A little bit of trivia for you, did you know that some teams don’t have a mascot? Because of that, not all thirty teams were represented. In the above, video all the mascots that did show up are introduced. Some mascots definitely have more personality than the others. At least to me, the mascots that have larger torsos were way funnier than the “skinny” ones. If you like what you saw above, here are the mascots engaging in a tug of war. I stepped in poop last Saturday. As you can imagine, it was not pleasant. Let me tell you how it happened. I was returning from the grocery store, I believe I had bought some oranges. My apartment building has several secured entrances but the one I used was in the retail area of the complex I live in. I stepped up to the door and placed my key fob on the sensor and waited for it to beep. At this point, I wasn’t aware I had stepped on poop. I tend to watch where I’m going but I honestly didn’t expect poop right in front of a door. Who leaves or poops in front of a door? Anyways, once sensor beeped and the little LED turned green, I pulled the door open and that’s when I started to step into the corridor. I noticed my back foot lost traction and slipped but I continued through the door while I looked down at my foot. At first, I thought I had slipped on a small pile of leaves as the door closed behind me. As I took two more steps, I realized that was not a pile of leaves. My right foot was leaving brown footprints behind on the linoleum of the corridor. I desperately wanted the brown stuff coming off my right shoe to be mud but I knew it wasn’t mud. A mixture of anger and panic flooded through me. Who the hell would leave poop right next to a door leading into an apartment building? Was it dog poop? Given some of the sketchy people I see hanging around the retail area, I couldn’t discount it being human poop either. I knew I could bring my poopy foot into the elevator with me. Instead of going left to the elevators, I turned right and went into the stairwells, all the while trying not to touch the ground with my poopy foot. I knew on a lower floor stairwell, there were some old rugs and doormats leading to the garbage room. For better or worse, I was gonna rub as much poop as I could on those rugs and doormats as there wasn’t a place to hose down my shoe. I went two floors down the stairs and rubbed my shoe clean as best as I could. Luckily, no one interrupted my poop cleaning. The bad news was that I had completely stepped on the poop with all my weight, which explained the slipping and the fact a large portion of the waffle sole was embedded with poop. Imagine an Eggo waffle but instead of delicious butter and syrup filling the crevices it was horrendous poop; that was my right shoe. With a considerable amount of poop crammed into the sole of my shoe, I gingerly made my way back to the elevators to get back into my apartment. When the elevator came, there were already people in it and I did my best not to let on that I was carrying feces with me. When my floor arrived, I again adopted this weird walk to prevent my right shoe from making too much contact with the carpet. Just outside my apartment, I unlaced my right shoe and took it off, placing it on its side so the poopy sole wasn’t making contact with anything. I went inside, put down my groceries and then placed a paper towel down. I opened the door again, grabbed my poop shoe and put it on the paper towel. It was at this point, I had a decision to make. Part of me just wanted to make dinner and watch hockey, and deal with the poop later. It was contained and wasn’t contaminating any other surfaces. Another part of me was still disgusted that these shoes I loved had moist poop on it. Also, I believed it was going to be easier to clean if the poop was still moist as opposed to dry. The clean side of me won out and I realized I had to clean the shoe immediately. It would have been easier to clean the shoe in a sink or my bathtub but there was no way in hell I’d let poop get near those places. I had to settle for the next best thing. I went out on my balcony which has a hole for rainwater drainage. I had put on some gloves and brought with me a water spray bottle full of hot water, a bottle of isopropyl alcohol, and some paper towels. I used the water spray bottle to fire tight streams of water into the waffle of the shoe sole to dislodge the poop. This was working ok, except that it seemed like the high pressure of the water was almost atomizing the poop particles and sending them into the air. The water could only do so much so I had to get a pointy BBQ skewer to really get deep into the crevices and dig out some poop. Bleh. When it seemed like I had cleaned out as much as I could, I poured isopropyl alcohol all over the entire sole in an effort to disinfect it. It was at this moment, I hoped that the poop was from a human because dogs can have worms sometimes and the thought of having parasitic poop worms on my shoe really grossed me out. I suppose the shoe is now clean but I haven’t worn them since. There is definitely a mental block there. Man, maybe I should just get another pair! Please watch where you step my loyal readers, I don’t wish this upon any of you. This evening I watched on Netflix a wonderful documentary called To Be Takei. The film is about the life of actor George Takei. It follows Takei in the present day, living life with his husband Brad Altman. Through interviews and older footage, Takei takes you through the many different chapters in his life: his internment as a child in the Japanese-American camps during World War II, his efforts to make it as an Asian-American actor in Hollywood, his rise to fame with Star Trek, and later on, his work as a gay rights advocate. There are some genuinely insightful and candid moments that Takei shares with viewers, stuff that I think even the most devoted Star Trek fan would have not known before. I found the film to be fantastic and Takei should be commended for the raw honesty that shows through from start to finish. If you are Star Trek fan or not, I think you’ll enjoy this glimpse into George Takei’s amazing life story. I don’t watch a lot of TV compared to when I was younger. In this day and age, there are so many different ways to entertain yourself that TV is no longer the sole choice of mindless fun. Because of that, I wind up trying out perhaps only one or two new TV series every fall for the last several years. It dawned on me this week there was a pattern to most of the shows I start watching. The majority of them get cancelled after less than two seasons, some barely have a singe one. What is it about the shows I like? Is it a curse that I put upon them? I don’t think so. Do I just like shows that are bad? I might be biased but I wouldn’t be watching shows that I thought was bad. Is it just bad luck then? Who knows. This spin-off from the Terminator universe was cancelled almost six years ago and to this day I’m still very sad about that decision. The show followed Sarah Connor and her future leader son, John (as a teenager) as they resumed their lives after the Terminator left them in T2. Future John sent them a new Terminator, a female one named Cameron to keep them safe. The show was cancelled during a cliffhanger, which is part of the reason why it was so tough to accept its demise. I’ll never get a resolution or closure from that last episode. This show was just from last year. Karl Urban portrayed a human police officer paired up with an android partner in this near-future buddy cop drama. It was filmed in Vancouver, which made it all the more enjoyable to watch. I walked by their set a few times in various locations when they were filming. The show never got farther than 13 episodes before it was cancelled. This show debuted just in September, this current TV season. This romantic comedy featured Karen Gillan (fresh off her gig on Guardians of the Galaxy) and John Cho (of hamburger and Sulu fame), in a modern-day remake of My Fair Lady. I usually don’t watch rom-coms but John Cho reeled me in at first. Then I saw that he and Gillan had some amazing on-screen chemistry. The show was really fun to watch, so of course, after just seven episodes, ABC cancelled it. The remaining six episodes that were filmed were tossed to Hulu like a dead body. What a shame the best episodes were aired after it was cancelled. So currently I’m watching two more new shows that I’m afraid probably won’t make it to next season. Constantine is the TV version of the comic book character. NBC chose not to order more than thirteen episodes for the first season, which is not a good sign. I’m also watching 12 Monkeys, which so far has only aired two episodes. Hard to tell what will happen to a show after only two episodes but then again, I do have that special touch. I see that a lot of these shows that I like and get cancelled are sci-fi and/or fantasy shows. It’s quite possible those shows are just harder to get a decent audience. I thought it was ok to like nerd stuff now! So Deadspin, a sports web site of all things, solicited its readers for their worst poop stories. I love these tales because I think everyone can relate to them. Who hasn’t had to go really, really bad at the most inopportune time at least once in their lives? To me, they’re better than any scary campfire yarn. In the above remote segment, funnyman Conan O’Brien visits Taco Bell headquarters with his staff IT manager. I love the food at Taco Bell, so I watched this visit with great interest. I’ve said it before and I’ll say it again, it’s a good thing I don’t live close to a Taco Bell or my health would honestly be in jeopardy. When I was sick and my throat was sore, I wanted to drink lots of tea with honey. It seemed like something that would be soothing. I went into my kitchen and realized I no longer had any honey from the last time I was sick. I went downstairs to Safeway to get some more. As many of you know, honey is expensive. Safeway had many different brands on sale, most of them local but all quite pricey. Then I noticed one particular brand was noticeably cheaper than the rest. I didn’t look at it too closely, other than seeing the words “Canada” and “pasteurized” on the front. I was in a hurry to make some tea, so this brand of honey it was. After making my first cup of lovely honey-infused tea, I looked at the back of the bottle of honey. It was there I realized why this brand was cheaper than the rest. The contents were a blend of Canadian and Chinese honey. That made me worried because I’m always wary of any imported foodstuffs from China. Growing up, my parents told my sister and I that food in China is much more prone to making people sick because of a shocking lack of regulations and ethics. I always assume that any foodstuffs from China will contain either lead and/or some dangerous chemical. Curious, I went and Googled “Chinese honey”. Many results came back and I was not surprised by the contents in the following article. For those short one time, a relevant quote tells us that “much of China’s honey production is tainted with pesticides, antibiotics, and heavy metal contamination”. Great. While there’s no evidence that the honey that’s in my bottle is tainted, I don’t think I’ll be buying this brand again. I’d recommend that you stay away from most foodstuff imported from China, it’s just safer that way. Because I’m still on antibiotics (you have to finish your whole course of treatment! ), I have to take a pill every eight hours. I initially tried to time it so that I’d take a pill before going to bed and then a pill when I woke up (or slightly after). Well last evening, my scheduled slipped a bit so I was up a few hours after my last pill for that the day. So I had to set my alarm so I could wake up, take the pill, and then go back to bed. For whatever reason, I was dreaming right before the alarm went off. Normally, I forget my dreams several hours after the fact, even if they are quite vivid. This morning was different however. 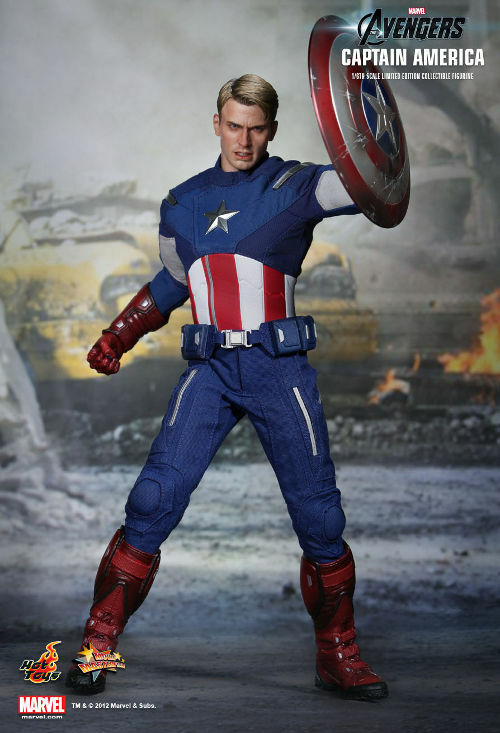 I was dreaming about Captain America, the Chris Evans version, and it seemed like I was seeing Cap from a movie point of view. There was a narrator explaining the origins of the Star-Spangled Avenger and I was seeing the start of some training footage. Then my alarm went off and as I woke up, I felt a distinct sense of disappointment that my dream got interrupted and I could see more of Captain America. I can’t remember the last time I felt so disappointed about a dream being cut short because I woke up. As I mentioned in my last post, I finally got on some antibiotics for that stupid sinusitis that I had. Though I was certainly feeling better on Thursday evening, I was feeling orders of magnitude better by late Friday. Three weeks of being congested and making so much mucous was finally solved by less than three days of antibiotics. I know we sometimes take modern medicine for granted but I was certainly reminded how thankful I am for what we already can do. I began to wonder what humans did before antibiotics. If I lived in the 1800s and I had this exact case of sinusitis, what would have happened to me? Would my body eventually just fight off the infection, perhaps six months down the road? Or would this have actually felled me in a fatal way? Well, 1800s me aside, it was fortuitous that I was feeling great by Saturday because I had a party to go. I somewhat marveled that after being shut-in and hermit for nearly three weeks, I’d jump from that to a huge party, with no baby steps in between. 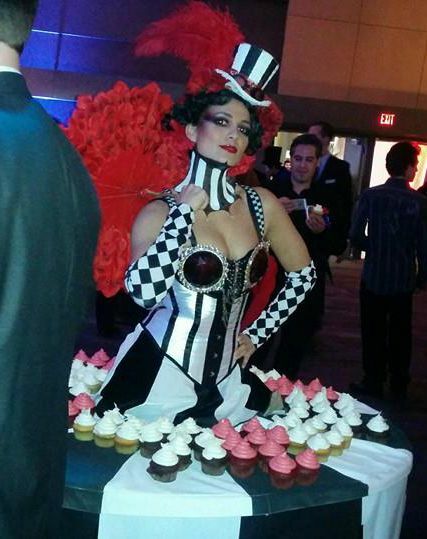 The occasion was the Electronic Arts Canada “holiday” party at the Vancouver Convention Centre. My friend had an extra ticket because his wife wasn’t interested in going, so he graciously allowed me to be his +1 for the evening. Along with spending some time with my friend, I also was looking forward to seeing any familiar faces that still work at the mothership in Burnaby. The theme of the evening was patterned after the world in the novel The Night Circus. It was suggested that men wear suits and women wear evening gowns. There were some fantastically dressed women there who really got into the circus theme. As for the venue, it was nicely decorated, mostly dark with purple accented lighting. They were wandering entertainers, a dude on stilts, a clown, and I’m pretty sure there was someone on a penny-farthing too. There were also some living statues and an acrobatic act on stage and from the ceiling (like using silks and hoops). As for food, it was kinda hit and miss. I wasn’t a big fan of the sliders and the hot dogs. There was also some weird “poutine”, which amounted to crudely cut chunks of potatoes barely covered in any cheese. The desserts were much better, which featured funnel cakes, candied apples, cake pops, and popcorn. They even had some lady who had cup cakes on her skirt. She was walking around and people would just take a cup cake from her. You can see a picture of that above. Later in the evening, they brought out gyozas. Near the back of the venue was a fun-house, complete with a hall of mirrors and a giant slide that went from the second story to the ground floor. Next to all of that was a whole row of booths that you might see at a carnival. There was skee-ball, fortune tellers, a temporary tattoo booth, and a place for you to win stuffed animals by popping balloons with a dart. I won a small stuffed penguin that I got tired of carrying around, so I left it on a table for someone to steal. The highlight for me at least was seeing so many of friends and acquaintances that I hadn’t seen for a while. It was very satisfying to talk to them all and find out how they were all doing. One dude told me he just had a baby with his partner. I didn’t even know they were expecting. I was prepared to leave early just in case my body wasn’t up to it but I felt fine all evening and left just before last call. I gotta keeping taking these antibiotics for another week or so but hopefully I’m good to go from here on it!